This instrument was marketed from 1961 to 1965 and is unique in being the only Harmony instrument with a built-in electronic effect – an electronic tremolo, powered from one 1.5 volt battery. Harmony H66, with original finish removed. Note the neck pickup is riveted tight to the bezel, whereas the bridge pickup is raised up, by means of dimples in the bezel. Also, these chrome bezels are slightly longer and wider than on some other similar pickups. (photos copyright B0200). 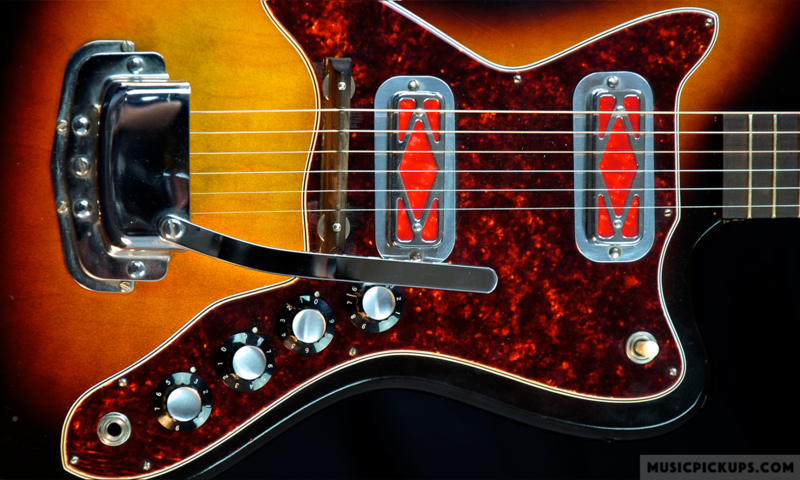 H66 Vibra Jet, 1961, Redburst finish (photos copyright B0488). H66 Vibra Jet , Tremolo control panel, front view B0200 (photo copyright B0200). A circular metal access cover for the battery – a 1.5 Volt LR03/AAA – is shown on the front face of the panel. (photo copyright Dave Walters).